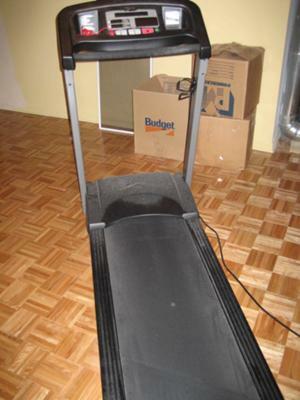 I purchased a Bodyguard Fitness Radisson treadmill perhaps 5 or 6 years ago. It has rarely been used and is in excellent condition. How much would you think it is currently worth? Join in and write your own page! It's easy to do. How? Simply click here to return to BodyGuard. 6 year old Bodyguard Raddison model with 2600 miles so far. We purchased the Bodyguard Raddison model in 2004. Even though I've grown tired of this model, it has faithfully served our purpose. It is a solid machine with no hint that it may be tired of doing its job. All the functions still work, no burned out lights even though it stays on 24/7. The plastic glued on part of the console came loose and I finally glued it back together after 4 years. Other than scraping a mouse carcass off the roller, (poor thing must have thought the belt was a nest.) this thing won't die. My model was made in Canada before the company's 2008 move to China. 1)Durability on belt and all the components. 2)Relatively quietness compared to other models at same speeds. 3)Non-folded frame with solid construction and a small footprint. 4)Simple design, however, this is also a negative as seen below. 5)Warranty was ahead of its competitors at the time, but now considered normal. 6)No visible wear on the belt, top side or underside. 7)No maintenance is required other than consumer level maintenance requiring no additional products or parts. I've centered the belt on rare occasions. Oh and I've opened it up to vacuum some dust out and to lubricate the height adjustment screw once. 1)It only has an 18" belt. I've come close to stepping on the frame a few times. 2)Only speeds up to 10MPH making interval workouts peak at that speed. 3)Only came standard with a front bar below the console and parallel to it. Expensive side handlebars are optional. 4)No program buttons or quick speed or elevation buttons. This requires constant pressing of the up or down arrows for speed or elevation. Speed changes in .1 MPH increments each press. Holding the button speeds the process up however. All in all, the bells and whistles are VERY limited on this model, but also has made this model have zero problems in nearly 7 years. All belt adjustments are easy to make but just following the instructions from the manual. when i see this movie i m so happy. Ask at least $600, no less, it's worth it. I have one of these models and it's worth the price, but people also see newer models with more bells and whistles like TV, ipod connections, quick acting buttons, etc. They fear that a 6 year old model won't last them, but in truth, it will outlast most newer models at a sporting goods store. We have 2600 miles on our model with no problems. No burned out lights even though it's on 24/7. It has done everything we have asked it to do flawlessly for 6 years plus. Remember, this model was made when that model was ranked very high for its price point. It was manufactured in Canada vice China as the newer models are.